New York, NY, March 8, 2018	(Newswire.com) - ​​High Performance Counsel was created to tell the story of the next ten years in the legal sector – often expressing this through the personal perspective and experience of some of the top thought-leaders in law. As such, the publication highlights the individuals, organizations and solutions driving change and innovation in the legal industry. The creation of #HPCLibrary is a natural next step, providing a robust platform for industry participants to find and share valuable thought-leadership and information resources with a growing audience of professionals interested in the legal industry’s future. #HPCLibrary will provide access to the HPC catalog of content, including iconic pieces like #Bakers18, together with prior interviews in the #BakersDozen series. Interviews from the new #FoundersDozen series will also be made available for download in #HPCLibrary. “HipCounsel’s library provides a bird’s eye view of the most interesting minds and hearts addressing vital issues in access to justice, technical innovation and changing business models. Inspiring, provocative and timely.” - Mary Mack of ACEDS, the Association of Certified E-Discovery Specialists. “Until now, finding stories of individuals who have driven innovation in legal services has been a hit-or-miss proposition. 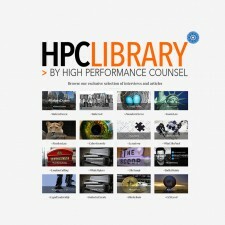 With the HPC Library, you can go to one place and read how others have overcome obstacles to reinvent legal services. This is a great resource for those looking to take their practices to the next level.” - Kenneth A. Grady, Adjunct Professor and Research Fellow, Michigan State University College of Law. “David Kinnear in his brilliant style is shining the light on so many of our legal sector contributors, touching many areas and educating us all on this thing called ‘Future Law’ – his library is a go to as a fast, stunning wealth of information.” - Kaylee Walstad, Director of Strategic Partnerships, ACEDS. “There’s a great deal of legal press these days. David Kinnear has applied his industry expertise and keen eye to curate a library that enables readers to tap into some of the legal industry’s top thinkers and doers. It’s a great one-stop resource.” - Mark A Cohen, CEO of LegalMosaic.